The Santa Clara-Ivins City Police Department was created in July of 2012 and includes all aspects of Law Enforcement. The police department staff includes a Public Safety Director or Chief of Police, a Captain, two Patrol Sergeants, Detectives, School Resource Officers in Lava Ridge Intermediate School, Vista Charter School and Tuacahn High School, a Washington County Drug Task Force Investigator, and Patrol Officers. Most sworn officers are cross-trained as Firefighters and Emergency Medical Technicians. The department also specializes in Code Enforcement and Animal Control with two full-time Animal Control Officers who work at the Ivins (No Kill) Animal Shelter. The police department is responsible for the safety and well being of the citizens of both Santa Clara and Ivins City which it serves. Duties include enforcing traffic laws and regulations, responding to calls for service, investigating crimes, maintaining the peace, taking care of animal problems, supplying information and educating the public, and responding to all fire and medical calls in the area. The police department works within the community and schools to educate and inform citizens regarding crime prevention, Neighborhood Watch, and other educational programs. 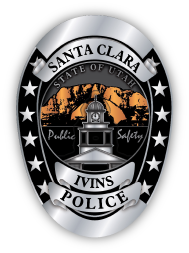 The mission of the Santa Clara-Ivins Police Department is to promote and deliver professional police, fire, and emergency medical services within Santa Clara, Ivins City and in the State of Utah through effective communication, unity, leadership and community involvement. Santa Clara and Ivins City are cities located in Washington County, Utah, United States and is part of the St. George Metropolitan Statistical Area.